Were talking minimal dishes, no standing over the stove making one pancake at a time (seriously how annoying is that — unless you have a griddle. Lucky.) and a recipe so easy that it’s pretty much foolproof. This has become a staple in my house. Matt and I love to indulge in this dish on lazy Sundays, drinking our lattes and watching the news like that’s all we have to do. It’s light, airy and satisfying, and it’s a beautiful sight when it comes out of the oven. 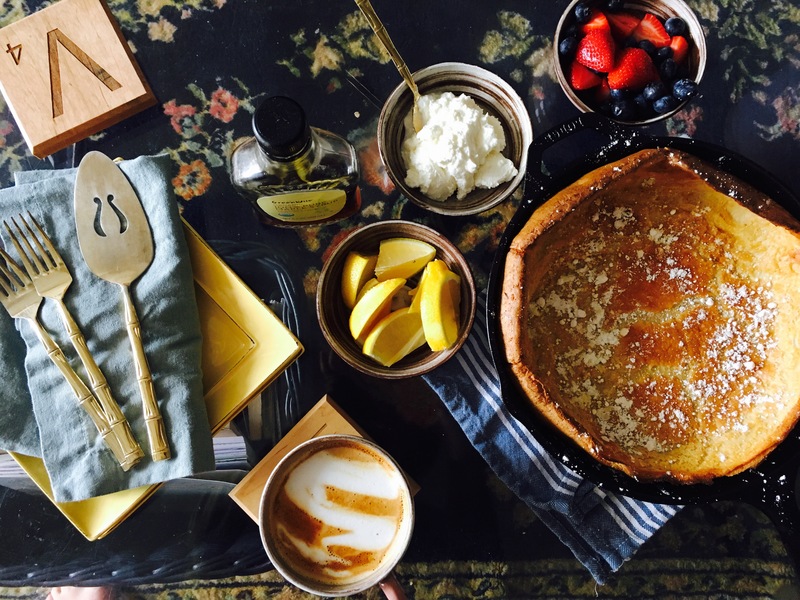 People are always a little wowed by The Dutch Baby, it’s a brunch stunner for sure. I’ve made this on holidays like Christmas Eve and for many surprise visits, like if my dad wants to pop over for a cup of coffee. I usually always have the ingredients on hand and it takes hardly any effort. Perfect for entertaining because you can actually enjoy yourself when you have company. Too bad I can’t just serve this on Thanksgiving. It’s sort of a mix between a pancake and a crepe. You can eat it with a fork or you can take a crepe approach and just pick it up with your hands (my personal preference). You can add just about anything to this basic recipe — eggs, milk, sugar, flour, butter and a pinch of salt — for deliciously endless possibilities. Was it a really hard week? Add a little less sugar and a lot more chocolate — you can also add cocoa powder and top with warm nuts or even Nutella. Also, if you don’t have a cast iron skillet, I highly suggest it. It’s affordable, easier to work with and maintain than you think, and it’s a champion in the kitchen. 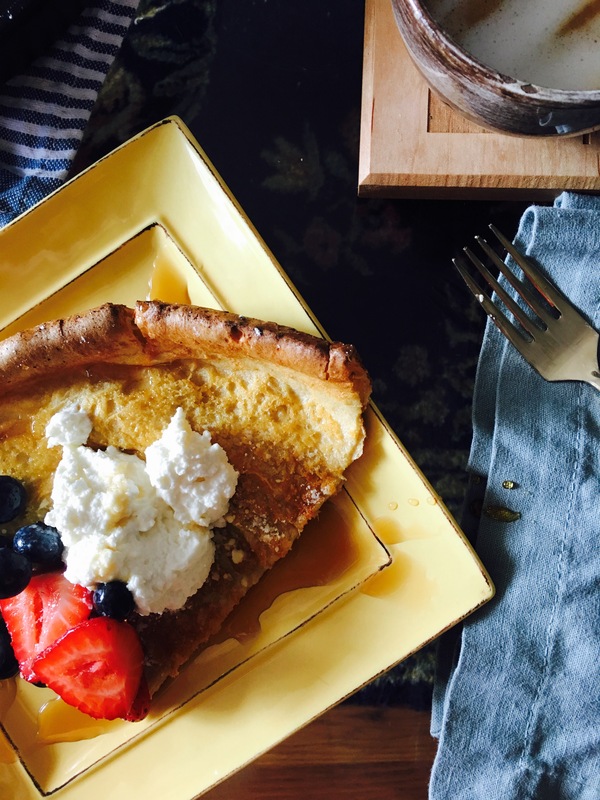 From perfect fried eggs to an entire roasted whole chicken (coming soon) and of course, this Dutch Baby, it’s a must-have. You can also make this savory by substituting the sugar with a creamy goat cheese and adding some halved cherry tomatoes in the mix (yum!) Top that with fresh basil and you just impressed everyone at your house, even if it’s just you. Hi, Brunch Superstar. In my favorite version that I’ll share with you below, I add lemon zest and ricotta for an Italian twist. The lemon keeps it light and delicate, and the creamy ricotta steps in (and totally kills it) as whipped cream. This recipe is inspired by this one, found on one of my favorite blogs, Camille Styles. Preheat cast iron skillet — or any oven proof skillet — 450 degrees. Vigorously whip eggs in large mixing bowl until frothy. Add milk, sugar, salt, lemon zest, vanilla and flour to eggs and let sit 10 minutes. Quickly, open oven door and add butter to skillet. With an oven mitt, swirl it in the pan to coat. Add batter to skillet and close oven door. Cook 12-15 minutes, or until edges brown and the Dutch Baby puffs up. Dust with powdered sugar. Serve with ricotta, lemon wedges, fresh fruit and the most expensive maple syrup you’re willing to buy.